The hosts come into this game with a 5-5 record and while the Greeks will be hoping to improve on this standing, it is actually better than the 3-7 record that is held by their opponents. You can always guarantee that there will be a feisty match in store when Greek and Turkish teams clash, and this is exactly what is in store for this Euroleague game on Friday night. The Greeks are strong at home as their 4-1 record indicates, and they’ll feel confident of adding to that tally in this game. Nick Calathes has been an integral figure so far this season for the Greens and if he can improve on his tally of 13 points per game and 5.3 rebounds per game, this will likely be a good night for Panathinaikos. Calathes can also boast of an average of 6.9 assists per game and 1.4 steals per game so his all-round game has been of a very high standard. KC Rivers has also found some form this season, offering an average of 11.1 points per game and Chris Singleton has provided the Greeks with an average of 11.3 points per game. Galatasaray started their campaign with 5 defeats in a row which means that they are 3-2 in their 5 most recent games. The team is yet to win on the road this season and this is likely to be a tough match. Justin Dentmon has been a big player for the Turkish side so far this season, offering an average of 12.3 points per game while Sinan Guler has offered an average of 10.8 points per game so far this campaign. The Turkish side are not well known for being a strong defensive unit but in their two most recent outings, they have limited their opponents to less than 70 points per game. 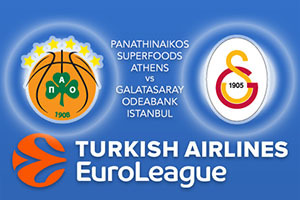 If you are looking to bet on this game, take Panathinaikos Superfoods Athens at -8, which is available at odds of 1.90. Anyone looking for the Over/Under market should go UNDER 158.5 which is provided at odds of 1.90. Bet Now!